Today, the pressure to demonstrate Marketing ROI has never been greater, and many companies are taking a more scientific approach to marketing, and treating it as a true business discipline. This means applying more rigor to capturing, analyzing and manipulating customer data, and delivering narrowly-defined messages designed to resonate with customers’ specific wants and needs. This process is called precision marketing. 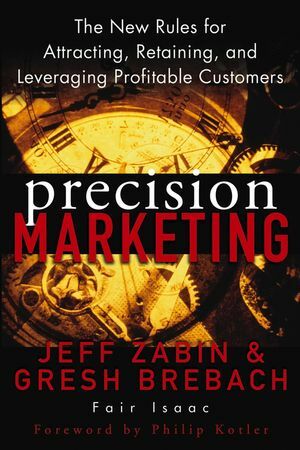 Based on extensive research and their own experience working with some of the world’s largest and most progressive marketing organizations, Jeff Zabin and co-author Gresh Brebach show how precision marketing can yield enormous business value. Writing in an engaging style that touches on everything from Renaissance thinking to Minority Report, they provide a definitive roadmap for combining precision marketing with mass marketing to cut costs, grow revenues, and create an overall competitive advantage. JEFF ZABIN is Director of Marketing in the Global Marketing Solutions group at Fair Isaac, the leading provider of customer analytics and decision technology. He is the coauthor of The Seven Steps to Nirvana. GRESH BREBACH is President of the Brebach Group, specializing in marketing services. Previously, he served as a Director at McKinsey & Co. and a Managing Partner of Accenture. 1. The Rise of Precision Marketing. 2. The Precision Marketing Cycle. 4. Precision Marketing in the Age of Gaia. 5. Fifteen Minutes of Privacy? 6. The Precision Marketing Future. Author Gresh Brebach is a co-founder of Seurat Company and a former Director of McKinsey, where he led the North American IT practice. Before his work at McKinsey, he was the Managing Partner of the North American Consulting practice of Andersen Consulting (Accenture). Jeff Zabin is a Director at Seurat and the co-author with Mohan Sawhney of The Seven Steps to Nirvana: Strategic Insights into eBusiness Transformation, a book that was praised by marketing guru Philip Kotler and the CEO's of McDonald's, Boeing, Aon and Eastman Chemical. The Father of Marketing, Philip Kotler, wrote the foreword to this book. This book coalesces one-to-one marketing, data mining and customer relationship management, showing students how exactly to pinpoint the ways in which complanies lose customers and partners and close the loopholes once and for all. The authors see a company's ability to form and sustain relationships as its greatest competitive advantage and the greatest value to shareholders.